Water is a universal basic need, but it is still a scarce privilege in many communities around the world. Bolivia is a representative case of the consequences of having a government that, traditionally, never showed interest in providing their citizens efficient access to clean water and proper sanitation. However, in an attempt to improve the water access in the most isolated areas of Bolivia, water management was privatised. Immediately after, the Bolivian population stood up against the measure and today the problems remain. 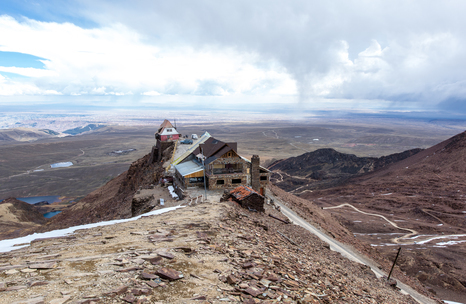 Our grantees Michele Bertelli, Felix Lill and Javier Sauras went to Bolivia to explore all the ins and outs of the country’s current situation. They have recently released the interactive and immersive web documentary Bolivia’s Everyday Water War, with which they present a complex story through a combination of storytelling and data journalism. We talked to Michele to learn more about their year-long work on this project. What is Bolivia’s Water War and when did it start? The entire recent history of Bolivia can be explained through people struggling to get access to water, but I would say that the actual Water War started 16 years ago. However, since the 1950s Bolivia had experienced an incredible lack of any kind of public water and sanitation infrastructures. Rural regions have been hit the most. There are plenty of areas where people do not have water access at all and do not even talk about sanitation. Moreover, there are big differences between the richest and the poorest neighbourhoods in cities. 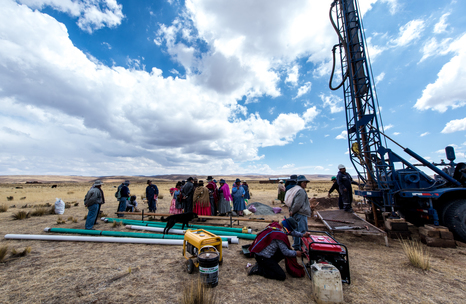 Since 2006, access to water has been one of the main actions perpetrated by Evo Morales’ current government, which started the programme Mi Agua (My Water). But there are still many neglected areas. Our idea was to go to Bolivia and to see how the situation has changed in the last 16 years. The Law 2029, approved by the Bolivian government in 2000, was a turning point. Could you explain what it actually implied? The Law 2029 was a consequence of a request of the International Monetary Fund and the World Bank. These two institutions were giving Bolivia a loan, but they were also asking for changes in the country’s legislation in return. Given the poor state of the country’s public services, they thought that the private sector could start taking part and improve access to water. 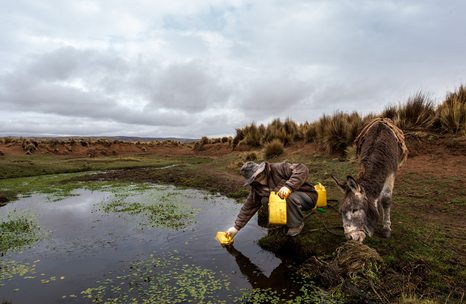 The law privatised Bolivia’s water management. The company Aguas del Tunari gained access to all the water resources in Cochabamba, the fourth largest city of the country. To give you an example: if people were collecting rainwater on the ground, that water was legally owned by the company. The law originated a massive uprising in Cochabamba, initially led by regantes, the Bolivian peasants. Finally, the Law 2029 was overturned. In remote areas not reached by water distribution systems, how do communities organise themselves in order to overcome the lack of government’s assistance? Bolivian citizens have a long historical tradition of getting organised. 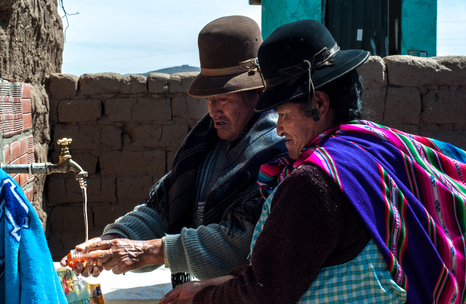 If you go to the villages on the region of El Altiplano, you will see that indigenous communities are organised according to their ancestral tradition, and they even have an overseer of the water sources. Then there are independent committees in the city of Cochabamba or cooperatives in Santa Cruz. One of them, the SAGUAPAC, is considered to be the largest and most efficient water cooperative of South America. All these initiatives act as a counterweight to the government. Drilling the soil, looking for water and connecting it to the houses are the main activities performed by the local committees. However, while some of them are very efficient, others are not so well administered and end up facing several economic problems. In the webdoc, the user can choose to follow the story from the perspective of three different characters from different regions of Bolivia. Why did you choose these specific characters? Marcela Oliveira, the water activist, approaches the Water War from a critical point of view. She started her work in the days of the Cohabamba’s uprising, when Evo Morales arose as the leader of the Cocalero’s movement. Today, however, she is very unsatisfied with the way the issue is being dealt with by the government. For us, it was important to tell her story because she embodies the engagement of local people to achieve their needs. With José Barros, a member of the Cooplan Ltda in Plan 3000, we brought up the topic of the water cooperatives. The Cooplan Ltda has arisen from the desire of some local residents to provide a good water service to their community. Our other main character, Jacinto Sirpa, represents the people who are most affected by the problem, the ones who live in disadvantaged areas and have never had access to clean water. As the head of his community, he has been searching for solutions to the lack of water. The grassroots efforts of people to fight the problem is the bottom line of the whole web documentary. 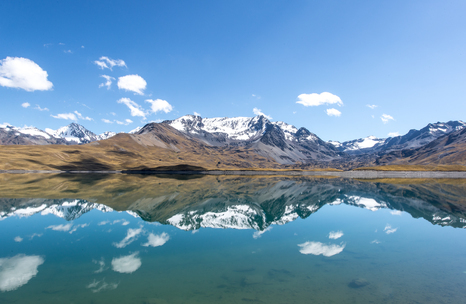 Your story highlights that glaciers in the Andes Range are progressively melting, which can cause their disappearance in 50 years. How will this affect the population’s access to water? This is a huge issue for cities like La Paz and El Alto, where 30% of the water comes from the glaciers. In the short term, the melting of the glaciers will provide an abundance of water for these populations. Over time, however, it will cause water scarcity since the resource is disappearing. Moreover the imbalance in the ecosystem will bring other severe consequences for the population, like the spread of new diseases which they are not prepared to deal with. 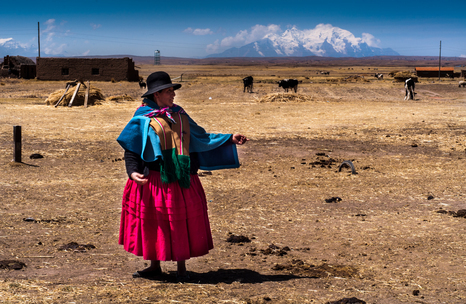 How can the debate around the water management in Bolivia be transferred to other countries? The uprising in 2000 against the privatisation of the water service was a milestone that sparked the debate all over the world: should a common good like water be privatised and how should we manage it? I believe that while Bolivia's Everyday Water War is a story that comes from Bolivia, it is not only about Bolivia. It can make people reflect on their own situation, even in Europe. The Water War is an incredible metaphor of every social conflict and every inequality in the world. What was for you the most striking finding of Bolivia’s Everyday Water War? The whole range of consequences resulting from the lack of sanitation systems. The right to water is not only about having clean drinking water, but also about the right of having sanitation systems. In Bolivia, as in many other developing countries, there are very few areas that are covered with proper sanitation and this is creating a situation where people and industries are constantly contaminating the soil and important water resources, like lakes or aquifers. The population needs to be educated on how to manage water. This would empower them to initiate reform. You worked in a team of three freelancers, all based in different countries. How did you organise your team? What makes or breaks a team cooperation on such an ambitious project? Three people composed the team: Javier, Felix and me. The idea was to have a small team in which each of us employs different skills. Javier is our reporter, Felix is a researcher, and I am a filmmaker. We also collaborated with a team of data journalists, an audio technician, a graphic designer and a social media editor. In our case, it was tricky to coordinate the efforts of a team spread across the world, since Javier lives in New York, Felix in Japan and our audio technician in Bolivia. I think loyalty and trust are very important for the team work. Besides, it is essential to have a clear division of roles, as well as a person coordinating the team in order to bring together all the pieces. Why did you choose to produce an interactive and immersive web documentary? We think that, as the story is rather complex, an immersive web documentary is the best way to explain it. An interactive web doc uses different tools and forms of storytelling, so the user can be involved in various levels. We want the user to take decisions that affect the outcome of the story. I believe that interactivity is one of the most interesting things that can be developed online, it is a great opportunity given by new media. In addition, development stories tend to be perceived as dull and boring. We believe that multimedia and interactivity could be keys to get people curious about these essential topics. What advice do you have for fellow colleagues when starting such a project? I think it is essential to define the technical details with the media outlets as soon as possible. You need to know which formats they support and the ways the content can be embedded in their websites, for instance. When you work with big media organisations, normally you are put in contact with people who are responsible only for the editorial part. Even though we have settled a strategy with our media partners from the beginning, we have faced technical incompatibilities in the end which took us a lot of time to fix. Why did you choose to release different kinds of stories in different media while anticipating the release of the webdoc? Did such a dissemination strategy prove beneficial? We decided to use this approach with the objective of spreading the story among different types of audience. For instance, we published written pieces on a German print newspaper because we believe that the paper market is still big there. Another motivation was to provide shorter versions of the story through other multimedia products, considering that some users may not have the necessary time to watch the webdoc. I think this strategy of dissemination worked very well since we had several publications in different formats. Besides, we wanted to build up interest around the project and prepare the ground for the release of the webdoc. In order to do that, we published teasers, launched a blog with backstage insights, as well as pages on social media websites. What kind of impact do you expect to have on your audience? We aim to challenge our audience to ponder on their own situation but also on the situation of developing countries. On the other hand, I think that our project will challenge the idea that Bolivia is an upcoming and booming country. We realised that some poor areas in Bolivia could be compared to the Sub-Saharan Africa. In developing countries there are still profound divisions within the population. Our project also raises the typical question of why we should invest money in countries like Bolivia, whilst we, Europeans, are also experiencing an economic crisis. What did you learn from Bolivia’s Everyday Water War that you could also apply to your new awarded project, Mothers and Children first? Actually, the story of Mothers and Children First and intercultural health arose while we were shooting Bolivia's Everyday Water War. In Bolivia we met a community that was mixing modern medicine with traditional heritage in order to provide for a new type of health care. We think this is a relevant story also outside of Bolivia. We now also have a clearer idea about how long the production process takes. This enabled us to allocate time and resources to each team member in more efficient ways. Also, while in BEWW we put a lot of effort into developing a clear storyline, the new project will have a much more fragmented storytelling approach, which will provide more options for users. An interview by Sarita Reed, intern at the European Journalism Centre. Sarita graduated in journalism at UFRGS, in Brazil, and is currently a Master student in Media Culture at Maastricht University. Paula Montañà, project coordinator at the European Journalism Centre, also contributed to this interview.